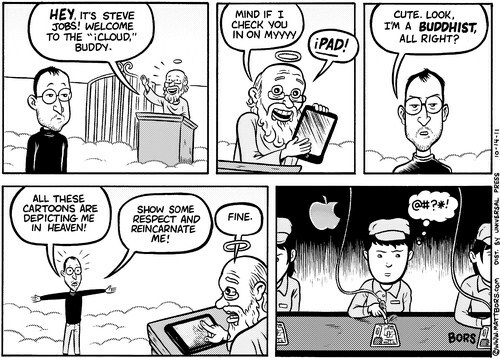 Steve Jobs is dead. The way that America has reacted bears more resemblance to the death of a president or a family member rather than an Oligarch. Over a week has passed an the tributes flow forth almost unabated. The new iPhone has been declared a memorial to him. (And what a horrifying way to boost sales, might I add. I’m not going to cover this ground, instead I want to focus on something I find difficult to understand. I think its strange that a man revered by the political left demonstrated so few of the qualities that the left claims to stand for. He was a tech visionary, that is true, but his vision was based on a shallow idea of style over substance. He was a billionaire, but engaged in little if any charity. He was a Buddhist, but promoted an intensely material culture. First lets look at his vision. His tech devices were based on style, not substance. In many cases, his products function no better than Microsoft products, they just look cooler. Everything about the appeal of the Mac, the iPhone, the iPod and the iPad are based on the “cool factor” of the design. It is entirely image driven. The difference between the iPad and the Xoom, both of which do almost identical things with identical apps, is that one looks sleeker and more stylish than the other. I know many people on the left (myself included) that would condemn an employer for hiring the prettier applicant, and yet, we chose the tablet based on how pretty it is. To carry this analogy further, my Xoom has 4G, which the iPad 2 will never have, it has a better camera, it can be directly hooked to my computer and it has expandable memory, all of which make it technologically superior to the iPad. Yet the iPad is the tablet to beat. It is like we hire the pretty person, with a degree from an average college, ignoring the fact that the slightly less attractive candidate has an advanced degree from Harvard. Almost all Apple products fall into this category. People can buy cool looking things from cool looking stores staffed by people called geniuses. And they do it religiously, even though there are equal or better products, at lower prices, that just aren’t as attractive. We would not tolerate this degree of shallowness anywhere else. Next is Steve Jobs’ lack of charity. I do not insist that people engage in charity, that is their choice. If people want to be selfish and hold on to their money, that is their right, even if it is not something I would do. I do not expect other to live the way I would in their shoes. My problem is how people, including many on the left, justify that lack of charity. Everyone keeps repeating that his charity was in giving the world these wonderful devices. He didn’t need to contribute money to famine or disease, he gave us shiny things to buy, and that was his gift to the world. There are others who justify his apparent parsimony by saying that he did his charity in private, and wanted no recognition for it. That’s fine, and even laudable, when you are an average or even moderately wealthy person. When you are the world’s 49th richest man, however, you have a duty to be visible in your charity. Steve Jobs was a cultural icon, and given that status, think how much good he could have done if he had followed the lead of Bill and Melinda Gates and visibly supported a charitable cause. People would have flocked to support it on the strength of Jobs’ charisma. If he wanted to do good in the world, think how much more he would have accomplished with the force of his public support for a cause. I don’t even buy that, because as head of Apple, he banned charitable apps from their devices. He banned the corporation from becoming involved in charitable acts. When he eventually relented and began the Red Products, it must be remembered that that charitable donation was the result of consumer spending. It was simply a way to make people feel good about blowing $400.00 on a new gizmo. Which leads to the last point, Steve Jobs poured fuel on the fire of consumerism. In a world of rapidly depleting resources, where some of the worst pollutants known to man come from the electronics industry, Apple taunts people to go out and buy, buy, buy. People I know who hold “Cradle to Cradle” and “The Story of Stuff,” as their Bible and Holy Mass, rush out and buy anything that rolls off of the Apple production line. I know people who sold their iPad, just to upgrade to the iPad 2, who discard perfectly good phones for the new iPhone, who dump another couple grand on the MacBook Air when they already have 3 perfectly good computers. The planet cannot sustain this degree of consumer frenzy, and people laud one of the orchestrators of this hysteria. Steve Jobs would not have existed if people were not frantic to consume his products, and his products contribute to the bubbles that are wrecking the economy. We made Steve Jobs, and the others like him, and they will be our destruction.